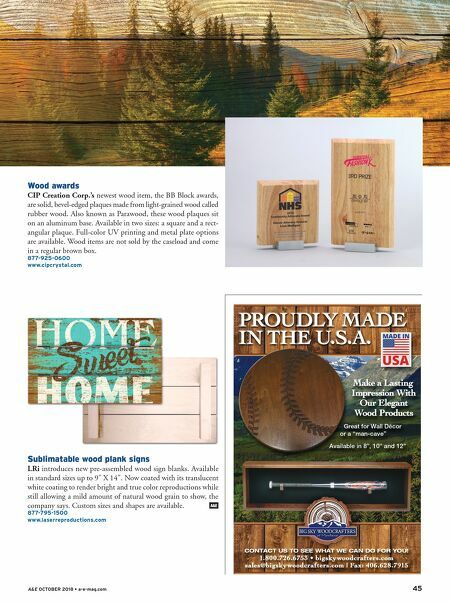 A&E OCTOBER 2018 • a-e-mag.com 45 Wood awards CIP Creation Corp.'s newest wood item, the BB Block awards, are solid, bevel-edged plaques made from light-grained wood called rubber wood. Also known as Parawood, these wood plaques sit on an aluminum base. Available in two sizes: a square and a rect- angular plaque. 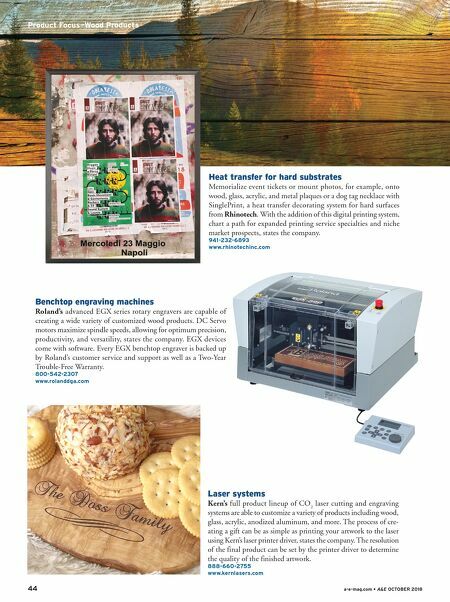 Full-color UV printing and metal plate options are available. Wood items are not sold by the caseload and come in a regular brown box. 877-925-0600 www.cipcrystal.com Sublimatable wood plank signs LRi introduces new pre-assembled wood sign blanks. Available in standard sizes up to 9" X 14". Now coated with its translucent white coating to render bright and true color reproductions while still allowing a mild amount of natural wood grain to show, the company says. Custom sizes and shapes are available. 877-795-1500 www.laserreproductions.com A&E Make a Lasting Impression With Our Elegant Wood Products Great for Wall Décor or a "man-cave" Available in 8", 10" and 12" CONTACT US TO SEE WHAT WE CAN DO FOR YOU! 1.800.726.6753 • bigsky woodcrafters.com sales@bigsky woodcrafters.com | Fax: 406.628.7915 PROUDLY MADE IN THE U.S.A.